Celebrate Saint Valentine's Day, the annual day of friendship and love, with a positive state of mind and a happy heart. Why wait for Congress? 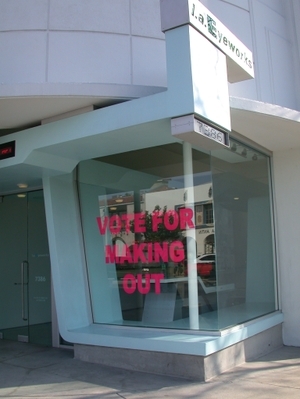 The l.a.Eyeworks stores are feeling the good vibrations and spreading the word with one message: STIMULUST PACKAGE. Because all you really need is love. Welcome to the brand spankin' new l.a.Eyeworks blog! Not unlike the Fiction blog, this blog will discuss, document, and report on all things l.a.Eyeworks. For our first post, we decided to go for something that was super fresh! Check out this image of our fabulously yummy Valentine's Day window that was just installed earlier this week! With the big day less than a month away, we've got plenty of time to get the city in the mood! Don't forget to check out other great shots of this window, and other recent ones in the web gallery.